Robersonville, NC – (6/19/14) For once this season Mother Nature seemed like she was going to play nice for the Robersonville area and provided a 0% chance of any weather issues as the speedway entered its first championship weekend under the NASCAR Whelen All-American Series banner. 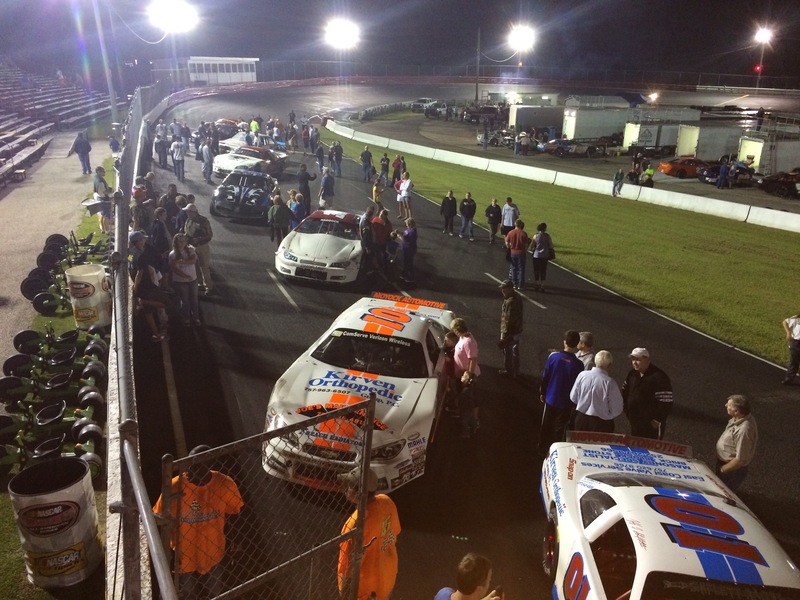 Five divisions were on the card for Friday nights fight under the lights where for the first time drivers were crowned NASCAR champions. Most of the divisions points battles were all but decided even before the green flag waved over each race, all but the always exciting UCAR division. David Wiggins entered the evening just two point’s (506) behind points leader Duane Walker (508). Due to the tracks points system Wiggins only needed to finish one spot ahead of Walker to take the championship home with him. 25 laps around the high banks of East Carolina Motor Speedway separated one of these two to the honor of a NASCAR champion. What made things just that much better was during their European style qualifying Wiggins set the fastest time earning the pole position with Walker lining up to his outside. When the green flag finally waved over the field, Wiggins must have turned the turbo on and opened the nitrous bottles because he opened a good eight-car lead over Walker. A scary moment in turn four for Mickey Connor with less than five laps to go, his machine went for a bit of a ruble dry cycle down into the infield. Have to give credit to the tracks officials and safety crews; both arrived on scene just moment after the car landed on all fours. Connor was able to exit the car under his own power, and no injuries were reported. Once clean up was complete and the field returned to green flag condition newcomer, well newcomer to me David Wall, got an incredible restart and took his machine to the front. The hard charging Wall was not able to mount a large enough charge for the lead but was able to take second place. With the dominant win from Wiggins and a third place finish from Walker, David Wiggins brought home the championship with a two-point switch.